A Federal High Court, sitting in Osogbo, Osun state capital has ordered the National Assembly to immediately commence impeachment process against President Muhammadu Buhari. The judge gave the order on Wednesday, July 4, 2018 based on the suit filed by two Nigerians, Kanmi Ajibola, a lawyer and Sulaiman Adeniyi, a human right activist, urging the court to enforce the National Assembly to impeach President Buhari. 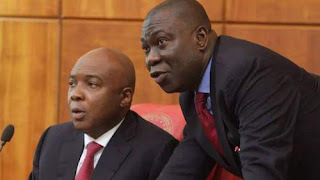 The duo had three months ago written to both the lower and the upper chambers of the National Assembly on the need to impeach President Buhari, citing alleged constitutional breaches by the president and threatened that they will approach the court if they failed to act accordingly. But when the lawmakers refused, they headed for court and filed a suit at the Federal High Court, Osogbo asking for an order of mandamus to compel both the Senate and the House of Representatives to start the impeachment proceedings of President Buhari. In the suit filed on Tuesday, June 19, 2018, they hinged their arguments on four grounds on why the National Assembly should impeach the Buhari. In the motion ex-parte, the duo claimed that in flagrant violation of the 1999 constitution, President Buhari contested election, won and was sworn in as the president on the 29th day of May 2015 without possessing the basic constitutional requirement, which would have made him qualified for the contest of the election. Besides, they accused the president of treating the orders of the court with great disdain and abuses the constitution of the Federal Republic of Nigeria at will, particularly from the angle of the observance of the Federal character as contained in section 14 of the constitution. “In the contrary, the 4th Respondent has proved to be unable to guarantee the security of lives and properties of the citizens of the Federal Republic of Nigeria in fulfilment of his oath of Office. The herdsmen killings of the innocent citizens under the 4th Respondent have been uncountable, unbearable and unprecedented overheating figures in the globe. “The 4th Respondent in contravention of the due process and sections 80 and 81 of the 1999 constitution spent about $496 Million on the purchase of Tucano Jets without the approval of the National Assembly of the Federal Republic of Nigeria as required by the law. “The 4th Respondent ordered to be withdrawn, money from the public fund of the Federation without the approval of the National Assembly or the authorization of its act and same used for the purchase of Tucano Jets. “The 4th Respondent has committed several impeachable offences, that is, gross misconduct. “By the provision of section 143 of the 1999 constitution, the 1st to 3rd Respondents (The Senate President, the Speaker of the House of Representatives and the National Assembly) have the statutory duty to impeach the 4th Respondent as the president and Commander in – Chief of Armed Forces of the Federal Republic of Nigeria on gross misconduct. “The 1st to 3rd Respondents have closed their eyes to the gross misconduct of the 4th Respondent. They told the court that as applicants in the matter, they have the right and duty to compel the 1st and 3rd Respondents to perform their statutory duty of impeachment against the 4th Respondent, having bothered on the constitution of the Federal Republic of Nigeria. Citing several constitutional authorities in the written address in support of the motion ex-parte and with 44-paragraph affidavits, the duo posed some questions by putting Nigeria side by side with some developed nations. “Can the conduct of the 4th Respondent, particularly on the presentation of a forged certificate, be condone in America or Great Britain unchecked? “Can the 4th Respondent continue to benefits from his act of forgery and infraction of constitution? “Definitely, an American president cannot be genuinely accused of presentation of a forged certificate and still be allowed to continue as the president, likewise the prime minister of the Great Britain”, they noted. Barrister Ajibola urged the court that with all array of documents before the court, he was of the view that the National Assembly must perform its constitutional duties without fear or favour. Justice Onyetenu in her ruling granted the application and ordered “that the National Assembly being the 1st,2nd and 3rd respondents commence the impeachment of President Muhammadu Buhari”. Further hearing on the matter has been fixed for October 30, 2018.